Job Vacancy Posting - Wetland Scientist position open at Tetra Tech Click here to apply. Job Vacancy Posting - Cartographer for the DEPARTMENT OF INLAND FISHERIES & WILDLIFE Office located at 284 State Street 41 State House Station, Augusta, ME 04333 Click here to apply. MAPSS - MAWS - MASE Soils and Natural Resource Field Workshop will be held at Reid State Park in Georgetown, Maine on Wednesday, September 4th, 2019. The Agenda and the Registration and information form can be downloaded. Here is the Lay of the Land winter, 2019 newsletter. MAWS Annual Meeting and Conference is scheduled for Thursday, March 14th, 2019, at Bowdoin College. The MAPSS Ad Hoc Affiliation Committee revised meeting minutes from the February 4, 2019 meeting with SSSNNE are completed. For MAPSS members wishing to join the Society of Soil Scientists of Northern New England (SSSNNE), the membership form can be downloaded. A Stream Monitoring Internship is available through Friends of Acadia. Please click here to view the application. A step by step visual guide to using Web Soil Survey (WSS) can be downloaded in PDF format here. This is needed to start the field derived methodology for HSG determinations. Here is the DRAFT Hydrologic Soil Group (HSG) field determination methodology. Please work through some of your actual field pedon descriptions using this 7 page instruction manual. A visual guide to Web Soil Survey is linked above. There will be a comprehensive presentation of this methodology at the Annual Meeting on March 13th. MAPSS Technical Committee meeting, Wednesday, January 23rd, 2019, at NRCS offices in Augusta from 9:30 am to 12:noon. 21 Enterprise Drive which is off Civic Center Drive (north of the Civic Center). Finalization of HSG field determination methodology. MAPSS Technical Committee meeting, Tuesday, January 8th, 2019, at NRCS offices in Augusta from 9:30 am to 12:noon. 21 Enterprise Drive which is off Civic Center Drive (north of the Civic Center). Further work on HSG field determinations and Connotative Soil Survey implementation. MAPSS Ad Hoc Committee on Affiliation with Other Natural Resource Organization(s), Tuesday, January 8th, 2019, at NRCS offices in Augusta from 1:00 pm to 3:00 pm. 21 Enterprise Drive which is off Civic Center Drive (north of the Civic Center). Replace your old Field Indicators Version with the new updated Version 4 Click here! 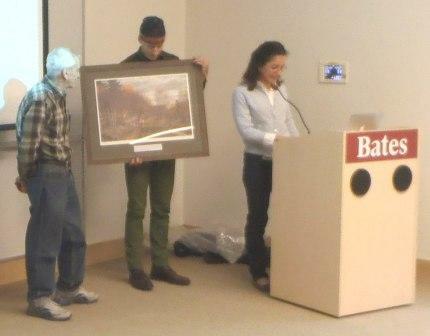 Recognizing Dave Rocque accepting his award at our annual meeting on Thursday, March 24th, 2016 at Bates College, in Lewiston. You will be pleased to learn that the Maine Legislature passed a Joint Resolution Recognizing The Importance Of Soils To Maine’s Future Prosperity on March, 16th! A new link has been added to the left navigation pane: "Current Issues Before MAPSS". This link addresses continuing efforts by MAPSS on several fronts related to regulatory, scientific, or of long term interests to members of the soil science community. Please use the link in the left navigation window "Past Events & Workshops - RESULTS (Write-ups, Comments, and Photos Albums are HERE)" to access MAPSS' archives of past workshops, meetings, and conferences.